For the past 20 years, Nathan Hawkins has been working with snakes in the small Texas town of Buffalo Gap. 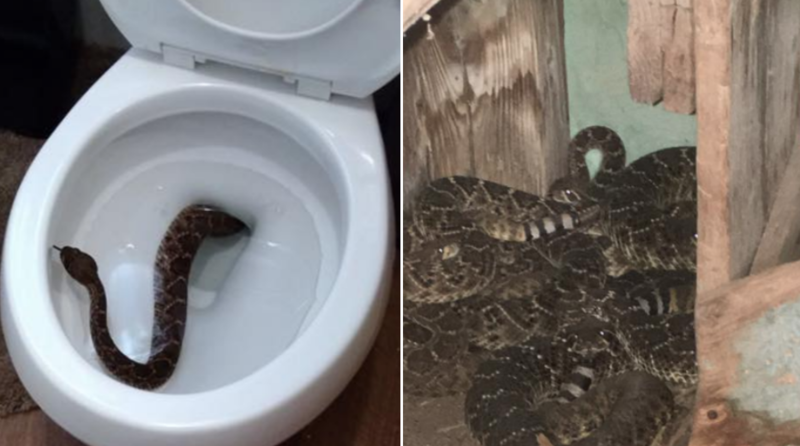 So when Hawkins, the owner of Big Country Snake Removal, received a frantic call from a family in Abilene, Texas, about a rattlesnake peaking its head out of a toilet — he thought it was “very unusual,” but not something he couldn’t handle. But to young Isac Mcfadden, who simply got up to use the bathroom Tuesday morning, the snake was an unwelcome surprise. The little boy’s mom told her son to grab a shovel, and when he returned with the tool, she killed it. Hawkins was surprised to find a dead snake upon his arrival, but he removed it from the toilet bowl and asked the family if he could do a quick house inspection to give them peace of mind. The first place Hawkins looked: an old storm cellar. Sure enough, he found 13 snakes huddled in the corner. But Hawkins’ search didn’t stop there. He then got down on his hands and knees and crawled around underneath the house. When he spotted a corner with old sheet metal, he predicted he would find another den. With a flashlight in one hand and a snake tong in the other, he caught another 10 rattlesnakes — 5 babies — in that location, adding up to 24 snakes in total. To outsiders, that number may sound high. But to Hawkins, it’s just another day’s work. Over the course of a year, since Hawkins opened his snake removal business, he has caught several hundred snakes. He fields about 50 to 75 calls a day. Some people call to ask questions, others request help with a snake on their property. Either way, Hawkins encourages residents who encounter a snake to “leave it alone” and phone an expert. “I would say 90 percent of snake bites occur when someone’s trying to harm the snake,” Hawkins said. Hawkins is proud that his business does not kill any of the creatures they catch. Instead, he relocates the snakes or donates them to local colleges to study. “I get to keep snakes alive that would typically end up with a gunshot wound,” Hawkins said.